Remember the movie Groundhog Day in which Bill Murray’s character got stuck in a repeating loop in which each day was a fresh February 2 no matter how the previous day ended? 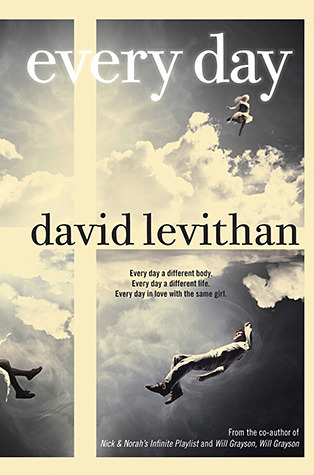 Author David Levithan takes this to another level. What if you had no body of your own and every day of your life you inhabited someone else’s body and memories for exactly one day? Every Day is classified as a young adult novel, but it’s a bit like The Hobbit or The Hunger Games series in that it’s well written and can be enjoyed by readers of all ages. Its protagonist is certainly among the most elusive of recent literature in that he/she/it is, by most measures, a rather typical 16-year-old who simply doesn’t exist corporeally and has no memory of ever having done so. For sake of organizing its own conscience independently of its hosts, it calls itself A, but it doesn’t spend a lot of time working a detailed identity. A has no control over where it will awake or inhabit. A has been male and female, straight, and gay. A has awoken inside athletes’ bodies, a Beyoncé look-alike shell, those of corpulent slobs, and those of drug addicts. A has been rich and poor, of different races, and a non-English speaker. If you were A and had never known any other existence, would it seem odd to you? Would you try to break the cycle? Probably not, unless something snapped you to another level of awareness. In A’s case, it’s an encounter with Rhiannon. In the most typical of all sixteen-year-old experiences, A has fallen in love. Rhiannon is in a bad high school romance with a jerk named Justin, whose body A used and reformed for a day. Can A express love for Rhiannon? Once A thinks about it, who would believe such a story, let alone put up with the logistical problems associated with being with someone whose physical presence changes every day? Moreover, A has learned to erase (most) of the 24-hour memories of his hosts and adheres to a strict non-interference policy. In other words, A has always been a good houseguest. But there’s something about Rhiannon that calls A back to her. Can he violate his own code? Would doing so trip unleash chaos theory’s butterfly effect? The novel is mostly about A’s relationship with Rhiannon, though it’s also a veritable sampler of the variety of sixteen-year-old minds. What is A? An alien? A demon? A trill á la Star Trek? A higher level of consciousness? A 24-hour virus? A parasite? Or just a normal 16-year-old who simply happens to have no body? Are there others like A? You read and you decide.